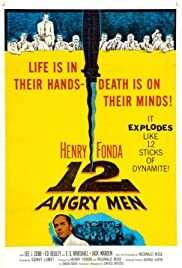 '12 Angry Men' is an outstanding film. It is proof that, for a film to be great, it does not need extensive scenery, elaborate costumes or expensive special effects - just superlative acting. The twelve angry men are the twelve jurors of a murder case. An eighteen-year-old boy from a slum background is accused of stabbing his father to death and faces the electric chair if convicted. Eleven of the men believe the boy to be guilty; only one (Henry Fonda) has doubts. Can he manage to convince the others? The court case provides only a framework, however. The film's greatness lies in its bringing-together of twelve different men who have never met each other before and the interaction of their characters as each man brings his own background and life experiences into the case. Thus, we have the hesitant football coach (Martin Balsam), the shy, uncertain bank clerk (John Fiedler), the aggressive call company director (Lee J. Cobb), the authoritative broker (E.G. Marshall), the self-conscious slum dweller (Jack Klugman), the solid, dependable painter (Edward Binns), the selfish salesman (Jack Warden), the calm, collected architect (Fonda), the thoughtful, observant older man (Joseph Sweeney), the racially bigoted garage owner (Ed Begley), the East European watchmaker (George Voskovec) and the beefcake advertising agent (Robert Webber) who has plenty of chat and little else. Almost the entire film takes place in just one room, the jury room, where the men have retired to consider their verdict. The viewer finds him or herself sweating it out with the jury as the heat rises, literally and metaphorically, among the men as they make their way towards their final verdict. Interestingly, the jurors (apart from two at the end) are never named. They do not need to be. Their characters speak for them. Henry Fonda is eminently suitable and excellently believable as the dissenter who brings home the importance of a jury's duty to examine evidence thoroughly and without prejudice. Joseph Sweeney is delightful as Juror No. 9, the quiet but shrewd old man who misses nothing, whilst E.G. Marshall brings his usual firmness and authority to the role of Juror No. 4. 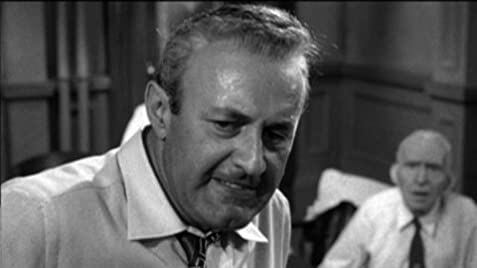 All the actors shine but perhaps the best performance is that of Lee J. Cobb as Juror No. 3, the hard, stubborn, aggressive, vindictive avenger who is reduced to breaking down when forced to confront the failure of his relationship with his own son. Several of the stars of '12 Angry Men' became household names. Henry Fonda continued his distinguished career until his death in 1982, as well as fathering Jane and Peter. Lee J. Cobb landed the major role of Judge Henry Garth in 'The Virginian'. E.G. Marshall enjoyed a long, reputable career on film and t.v., including playing Joseph P. Kennedy in the 'Kennedy' mini-series. Jack Klugman was 'Quincy' whilst John Fiedler voiced Piglet in the 'Winnie The Pooh' films and cartoons. Of the twelve, only John Fiedler, Jack Klugman and Jack Warden* are still alive. Although around the eighty mark, they are all still acting. The film was still available on video last year and it is shown on t.v. fairly frequently. I cannot recommend it too highly! 457 of 500 people found this review helpful. Was this review helpful to you?